Two recent reports on ICT by the UN Working Group and Aljazerra have attracted national and international attention. They show their sensitivity to the pre-trial custody of the alleged accused facing trials and insensitivity to the pursuit of justice for the victims. Working Group: Its Opinion No. 66/2011 (Bangladesh), submitted to UNHHR on 6 February 2012, states that “after more than one year in pretrial detention ... the defendants have not yet been formally informed of the charges” (para 42). It makes the final deposition that such detention “is arbitrary” and “constitutes a breach of Article 9 of the UDHR and Article 9 of the ICCPR, falling within category III of [arbitrary detention] cases submitted to the Working Group” (para 43). The report is a response to communications submitted by the defence in the trials on behalf of 6 specified detainees, namely Motiur Rahman Nizami, Quader Molla, Kamaruzzaman, Ali Hasan Mujahid, Delwar Hossain Sayedee, and SQ Chowdhury (paras 3-33). The Working Group forwarded these communications on 12 September 2011 to the government, which did not respond or refute the allegations in the communications (para 40). So the defence arguments in the communications, without any inputs from the government, formed the sole basis of the opinion. This contextualisation of the report is crucial, which clearly renders it one-sided by any standard. The two yardsticks used are UDHR and ICCPR. UDHR has its own merit and moral force but, being a UN General Assembly declaration, is not binding for any country. Being a party to ICCPR, its provisions are applicable to Bangladesh, which has a right to respond but not exercised. In order to be “arbitrary”, a detention must be indefinite and lack of predictability. This requirement is consistently been advanced by a whole range of decisions by the International Human Rights Committee exemplified by A v. Australia 1997 (para 9.2). Indefinite and unpredictable detentions become “arbitrary” when no charges are framed and trial commenced, such as the detainees in Guantanamo and other secret prisons in various parts of the world controlled by CIA under its rendition program of outsourcing tortures. After ten years, there are Guantanamo detainees without charge and trial and the US is likely to use them as trade-offs in its ongoing talks with the Talibans. There appears to be no particularised report, like Bangladesh, by Working Group on arbitrary detention in Guatanamo, except a general one which is barely more than a whisper and far less than a roar. Alleged perpetrators of international crimes are usually taken into custody on the basis of a prima facie finding, which is conclusively proved beyond doubt in trials. This explains why high profile heads of states like Pinochet (Chile), Milosevic (Yugoslavia), Karadzic (Serbia), Taylor (Liberia), and many others had either spent, or are spending, a substantial period of time in pre-trial custody. The UN Criminal Tribunal for Rwanda “has detained some of its suspects for more than 10 years” (Radio Netherlands Worldwide, 15/2/2012). The UN-Cambodia Chamber held the alleged genocide perpetrators for more than one year before the commencement of formal trials. Has the Working Group produced any report on these tribunals' pre-trial detention as “arbitrary”? The answer is no. Have these tribunals, despite their UN involvement and a big budget, detained “arbitrarily”? Certainly not, because gathering and presenting admissible evidence in trials of international crimes is more challenging and time-consuming than that in domestic criminal trials. The ICC is yet to give judgements in trials commenced 10 years ago. The 40-year old Cambodian and Bangladesh cases are doubly difficult for any prosecution. Every international crimes tribunal, including the ICC, commenced with a cautious approach. Once it kicks off, it gathers pace and momentum. The past legacy of the commission of crimes in wars was a by-product of power and weapons to effect the contemptuous subordination of enemies. Their legal governance was marked by ambivalence and silence. The emergence of powerful human rights movements to end the impunity of gruesome international crimes within the corpus of norms and criminal prohibition is of recent origin. It is strategic for war crimes trials to be gradually progressive and somewhat guarded. This was precisely the environment in which ICT started, which is fast maturing and improving. There is absolutely no reflection of these reality checks in the report. Pre-trial custody for more than a year, claimed in the report, is not unusual and necessarily arbitrary in view of the examples cited above. Its assertion that the accused has not been informed of the charges against them was not true when the report was submitted on 6 February 2012, when Sayedee's trial of formal charges was well underway with witness examination and cross-examination and others' charge-framing hearing ongoing. Both prosecution and defence sought and got additional time for preparation, causing delay. Detention will certainly come to an end by conviction or acquittal. ICT is fully a domestic tribunal of Bangladesh which, being a resource-constrained LDC, has been trying its best to conduct these trials as fairly and speedily as one can realistically expect from LDC standards. The civil society has brought to bear considerable pressure for speedy trials. Apart from its election pledge, the government has repeatedly made public commitments to expedite the process with the announcement of another tribunal soon. The Prime Minister on 3 February 2009 requested, through the UNDP Representative and UN Coordinator in Bangladesh, for UN helps holding the trial. Bangladesh has received no UN assistance whatsoever. The report's final deposition does not say that Bangladesh has violated international law, except an oblique reference that “in international law, detention prior to conviction should be an exception rather than a rule” (para 39). Pre-trial detention in exceptional cases does not violate international law. Ample precedents exist testifying that alleged war criminals usually fall in the exceptional category. There are no international legal criteria or standards to be followed in determining exceptional cases, which vary from case to case, tribunal to tribunal. All alleged accused in Bangladesh are placed in detention by ICT orders in view of the prevailing circumstances a judicial decision which is difficult to evaluate politically. This explains why the report has not raised it expressly in its deposition. AlJazerra report: Its report of 15 February 2012 is a rickety affair with distorted facts to confuse public, motivated agenda to undermine ICT, and speculative conclusion to frustrate Azam's trial. It says that the Working Group report “concluded that the detention of Azam and others as arbitrary and in breach of international law”. The Working Group report is all about “others” 6 mentioned and makes no mention of Azam anywhere. The claim of “breach of international law” is yet another manipulation explained above. Azam is charged not as a “former Islamist leader” but for his alleged commission of war crimes in 1971. It not the belief of ICT that Azam collaborated with Pakistan army but the history and Azam's record speaks louder than what the reporter is inclined to hear. Of course the crimes were “committed more than 40 years ago”. So did the Cambodian genocide in 1970, which are now on trial. Even today, trials continue for crimes committed during the Second World War. Excesses of the reporter's imaginative journalism abound. The claim that “the 89-year-old Azam cannot walk, cannot see, nor can he really hear” has been refuted by his medical team (DS 17/2/2012). His age is no bar to face trials. All four accused in the Cambodian trial are aged between 85 and 88 years. Ieng Thirith, a woman of 86 years old, was found medically unfit for trial in November 2011 but the Cambodian Chamber held that her health could improve during trials. Demjanjuk was 89, suffering from leukaemia, a trapped nerve, and gout, extradited from the US to face Nazi war crimes trial in Germany in 2009 and he was brought to the court in a wheelchair. I can prepare an endless list of war criminals, who face trial at around the same age as Azam (viz Boere 88, Storms 90, Hajda 85, and Scheungraber 90). The reporter's speculation that Azam's punishment would be “at the price of throwing Bangladesh into further political instability” is preposterous. It ignores the overwhelming popular support for the trial expressed in the 2008 election. Not to try the alleged accused can trigger serious political unrest. The reporter is inherently dismissive of Azam trial, blatantly biased, and profoundly unprofessional. AlJazerra's defence is its right to freedom of expression, which wants us to listen to things that we dislike or views that we disagree. But freedom of expression must be balanced by its accompanied obligations. There is no legal right with duty-free application. AlJazerra's reporter has interrupted this balance through inconsiderate, provocative, and irresponsible media casting in public domain. The media right to freedom of expression must be guarded not only against its deniers and suppressers, but also against those who use it cynically and deliberately, like Nicolas Haque, as a licence for voluble bullies and stratagems to assault on the feelings and rights of the overwhelming silent majority seeking justice. Prosecution, conviction, and punishment of perpetrators of international crimes are on the increase. The international community and the UN have been in favour of ending the impunity and immunity of these perpetrators by bringing them to justice. Amidst these developments, these two reports have failed to endorse, not even in principle, any need to render justice to the victims of the 1971 war crimes. Such a positive approach with recommendations for improvement in ICT's performance would have been rewarding for Bangladesh. Instead, they ill-conceived the facts and unduly pursued a heavy-handed and partisan approach that serves the sectarian interest of those subverting the course of justice. Why are these reports on ICT and not on other tribunals with long pre-trial detention and trials of ageing with ailments? Can the Working Group and AlJazerra answer why are only the Africans prosecuted before the ICC with no decision yet in 2012 for trials it initiated in 2003? This is a price one has to pay for being poor, powerless, and voiceless in asymmetric global power-games. 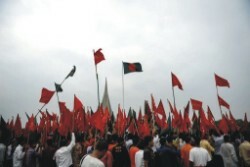 Bangladesh was born defying formidable resistance. Given the resources, lobby, and connection of the alleged accused and their allies nationally and internationally, relentless opposition to ICT for immunity to prevail over justice is expected. The quest for justice heeds only constructive, not lacklustre and gerrymandering, criticisms. The writer is Professor of Law, Macquarie University, Sydney, Australia.